Lighting is the key for seniors to navigate their homes at night. 1. Lighting is the key-It may seem like common sense that lighting is important however, many seniors simply do not have enough lighting or even strong enough eyesight to navigate their homes at night. Today, there is no reason to have this happen. There are lighting systems which have motion sensors so when the senior gets up at night they will automatically come on. 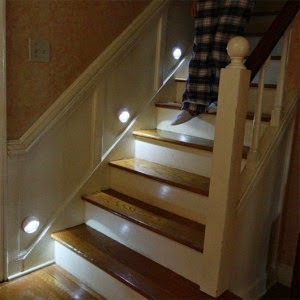 These lights can be placed throughout the home so the individual can easily move from room to room no matter the time of day or night. 2. Prevent slips-Many older individuals do not have the strength to prevent slips. It is important to go through the home and look for potential slip hazards. Removing rugs, taking out slippery floor material(replacing it with non-skid), and making sure all floors are straight and even can go a long way toward preventing night falls. 3. Provide safety-Many times seniors will slip and fall when arising from bed or trying to sit down on the toilet at night. This can be easily remedied by installing grab bars and handles which can help them becomes steadier as they move from bed to bathroom. 4. Look for obstacles-Keep in mind the same path around the home during the day can become an obstacle course at night. Take the time to look through the senior’s home at night and see if there is furniture or other objects which can become barriers to safely moving through the home at night. Sometimes all it takes is just moving something a little to make the home a whole lot safer. 5. Provide a way for help-Nearly everyday there are stories concerning seniors who have slipped and fallen and are not found for hours or even days. To prevent this from happening consider installing a warning system which will allow your senior to access help even if they have fallen. This can be anything from a bracelet or necklace which can be set off for help or a complete video system that allows someone to see if they have fallen. 6. Consider the clothes they wear-Seniors often have certain nighttime habits and one of those may be what they wear to bed. However, those slippers (no matter how pretty), can be a fall hazard if the soles are too slippery or the heels to high. Bedclothes can catch on objects and easily pull a fragile senior done. While it may be hard to discuss with a parent or other loved one, helping them select the right nighttime clothes can offer them another layer of safety. 7. Realize there is no one size fits all solution-Finally it is important to keep in mind each person will have specific needs which can help to prevent falls of any kind. Taking the time to assess each individual’s needs is crucial.